13pack Mix Adapter --- Applicable to common mobile hard drives, laptop computers, use a different cable equipment. Can Meet Almost all USB3.0 Adapter you need. 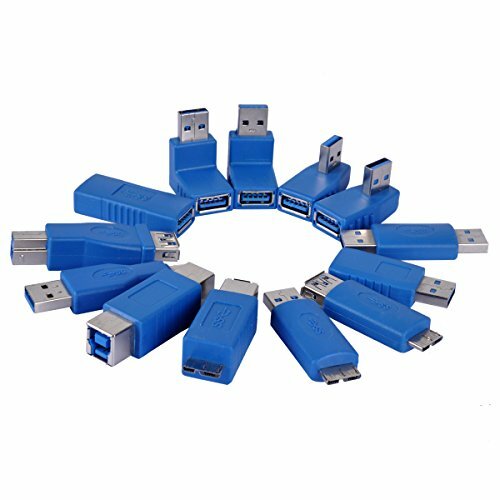 Super Speed Connection --- USB 3.0 SuperSpeed, data transfer speed of up to 5Gbps. Plug & Play --- Can easily be connected with computers and other equipment for data communications, file transfers, etc. Solve Connect Trouble Backwards Compatible USB2.0/1.1/1.0. Minimalist Design --- Tiny, lightweight, durable adapters, convenient to take with you wherever you go, great gift for your family and friend. Package Contents --- USB male to female adapters, male to male adapter, female to female adapter, male to micro b, etc. If you have any questions about this product by UCEC, contact us by completing and submitting the form below. If you are looking for a specif part number, please include it with your message.